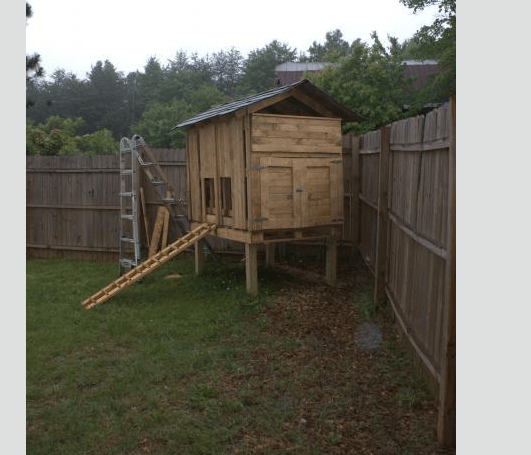 Chicken Coops For Two Chickens – Small Is Good! - FREE CHICKEN COOP PLANS! 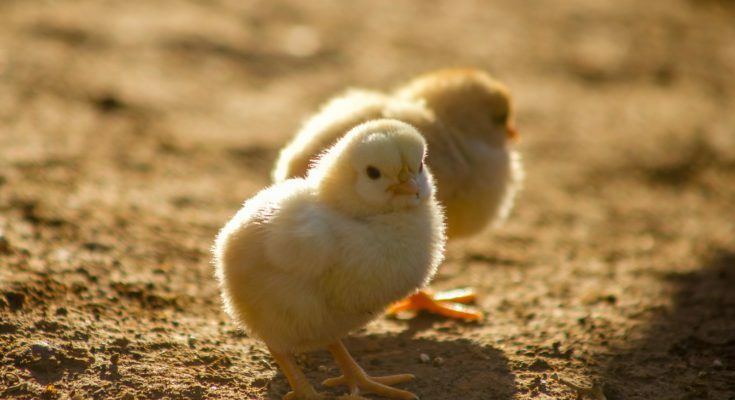 Whether you are wanting a couple chickens for eggs, as pets, or to simply just try your hand at raising a small flock of chickens, you’re not alone! 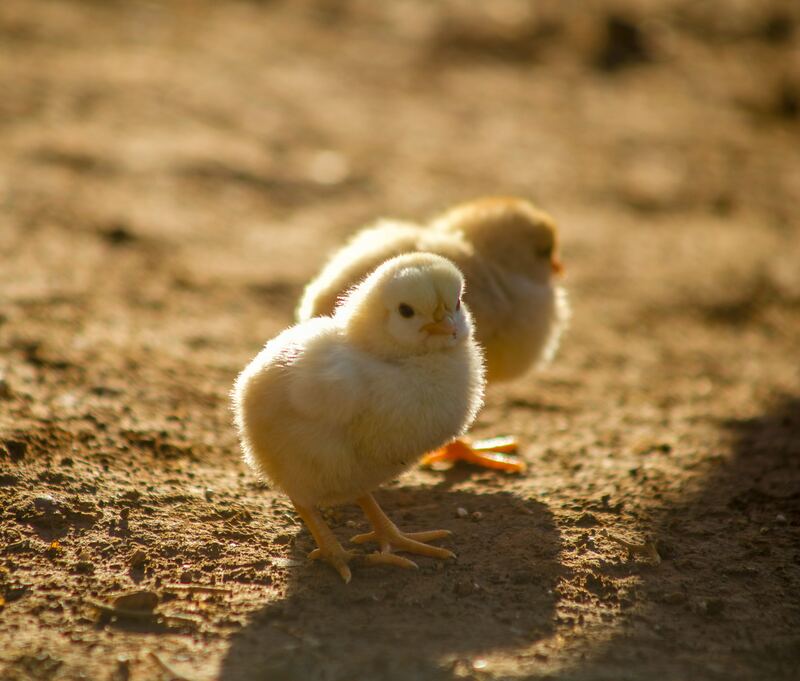 There are thousands of people out there living in both urban and rural settings that have caught the chicken raising bug. 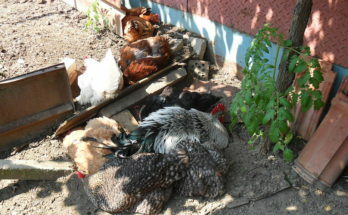 Wikipedia states that people in urban settings are now raising chickens in greater numbers – as pets, for eggs, or food. And it’s really quite simple to get started – a small coop, a water source, a feeder, and a bit of space for them to roam and you’re set! We’ll take a look at what’s needed to get started and few ideas for small chicken coops, whether they be homemade or bought at a farm store or ordered online. What’s great about a coop for just two chickens is that they don’t take up much space and can be placed just about anywhere in your yard. You can tuck it away in a corner or have it proudly displayed wherever you like! Size: The estimated square footage per chicken is 2 – 3 square feet (sf) so plan on a minimum of 4 – 6 total sf per chicken. More is always better as they’ll enjoy the extra space. 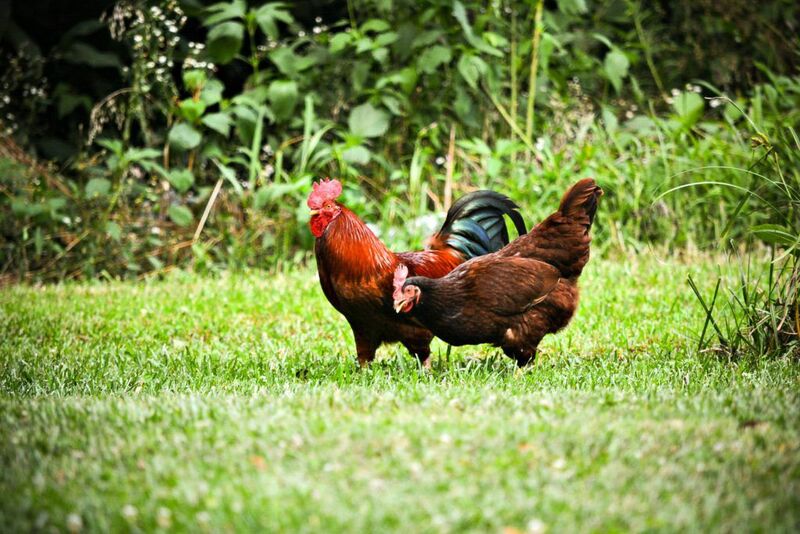 Something to keep in mind is whether you’ll be free ranging your dynamic duo – if so, more space is not necessary as they’ll be out foraging in the yard all day. But if you plan to keep them contained, you’ll need to add a Run to the coop so they have added space to move. The space needed for an attached outside run is 8 – 10 sf per chicken. This adds a bit more size and bulk to the overall design but you also have a lot more control over where they roam. It also makes it less likely they get killed by a predator. What’s Needed For A Small Coop? You’ll need the same supplies you’d need in a larger coop but scaled down versions. Roost about 2 feet long (longer if possible). Easy to make or simply buy online. When searching online they also offer a roost/nest box combination which takes care of two coop accessories all at once but costs more. Nest box (one is sufficient). Easy to make but can be bought online for a reasonable price. Feeder – again, nothing too huge is fine. A 1 gallon size will work great or there are dozens of great options you can buy online. And if you’re feeling adventurous, make a homemade one! We show you how here. Watering System – These can be as simple as a one gallon waterer you can buy at the farm store or online, or you can make a homemade one like ours which is affordable and completely automatic – we love it! We show you how it’s done here. 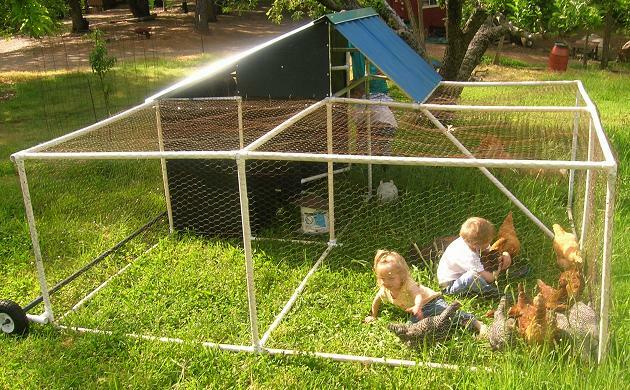 There are a plethora of ideas that can work great for building small chicken coops. Because they don’t need to be as large, little coops can be made out of things that would not be possible in larger coops, like 55 gallon barrels, an old dresser or cabinet etc. Below are some of the materials available for building small coops. More information on chicken coop designs can be found here. Wood is always a great option for building chicken coops of any size. You can fashion or design it however you want! Some combination of Cedar, Pine, and Plywood will work great to build a sturdy coop, as long as it’s painted or stained to protect from the elements. Plywood is a common type of wood for building chicken coops because it comes 4 ft x 8 ft sheets from the store. You can cut out the floor, sides, and roof from one or more of these sheets for your small coop. Of course the framing will need to be made of either 2×4 or, at a minimum, 2×2 lumber. For roofing, asphalt shingles work great. Or you can buy a small piece of metal roofing for added durability. 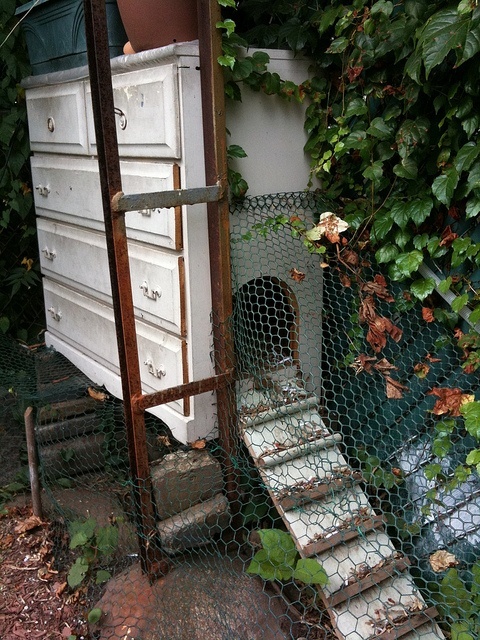 Just when you think you’ve seen it all…then there’s the dresser chicken coop! Who would’ve thought this could be done. Well apparently it’s more popular than we realized. A quick search for dresser coop in your favorite browser will pull up a ton of ideas for you to consider. It’s a remarkably simple design but does take some extra work to cut out some of the drawers in a way that will work to house your chickens. But it may be worth it for the potential cost savings. A used dresser can be bought at a thrift store for just a few dollars. Or, use an existing dresser and get yourself a new one! Some dressers are up to 5 drawers tall which is great for a larger flock…but for 2 chickens a simple two or three drawer dresser should comfortably house your pair of hens nicely. One thing to be aware of if considering using a dresser for a coop is that you should really use only real wood, not particle board which can’t tolerate the elements very well. Dressers are designed for indoor use so they will need to be properly painted, sealed, and waterproofed for outdoor use. Believe it or not, an old barrel can function nicely as a small chicken coop. We’re talking the 55 gallon drum type, which provides enough space for your two chickens. Not only are they easy to find, but they are often made of plastic, wood, or metal which are very solid, durable materials that hold up well against all kinds of weather! 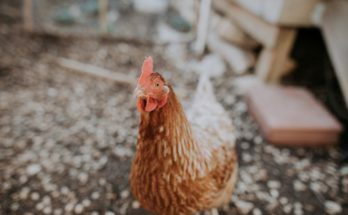 Because of it’s round shape, however, there are a few modifications that need to be made to make it a user friendly coop for both you and your chickens. Also – if you plan to re-use a barrel that contained some type of harsh chemical, rinse it out thoroughly before adding your chickens! And like with any coop, make sure it has enough ventilation. Pallets may take a bit of extra work to make a sweet little coop, but it can be done! The bulk of the work is taking the pallets apart, but you can do it by carefully using a hammer and pry bar. The big pay off is the amount of money you can save – many pallets can be purchased for free or nearly free from Craigslist. Above is an example of what can be done with pallets! Of course for just 2 chickens you could make it MUCH smaller, using just a few pallets to accomplish something similar. A really affordable option that can be assembled rather quickly is a PVC pipe. PVC piping is basically plumbing pipes made from a type of hard plastic. They are also quite cheap to buy at a big box store like Home Depot, Lowes, or your local hardware store. If long enough, PVC pipes will arch into a half-circle shape and can be made into a Hoop house. The picture below shows one such house made of PVC pipes and a tarp. It’s a cheap, easy design and should last quite awhile, although you’ll have to change out the tarp every year or two as it’ll take a beating from the elements. I’d also recommend staking it in the ground so the wind won’t blow it out of your yard! If you get creative, you can make a pretty sweet looking coop out of PVC. The below picture is a great example, and even includes a free plan on how to make it. It’s plenty big for just 2 chickens, though, so plan on scaling it down significantly. 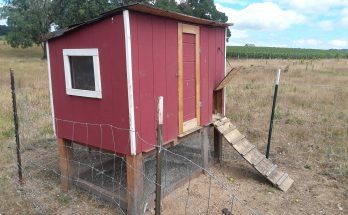 The PVC pipe coop below uses nice metal panels which are great but add to the cost. Many people use tarp roof which is completely functional but may need replacing every year or so. Box Stores – Because a coop for two does not involve a lot of material cost, you can get wood from your local box store (Home Depot, Menards etc. ), or check out a few local reused building materials resource stores. It’s amazing what you can find there – lumber of all kinds, roofing materials, nail, screws, and sometimes even PVC, used barrels and more. Used/Repurposed Supply Stores – If you’re feeling adventurous (and creative), go to a used building supply stores and simply see what they have in store that day and fashion a coop out of the available materials they had in the store. Granted, not everyone can pull this off…but if you see an old barrel there, some leftover plywood (or whatever catches your eye), you can find plenty of information on the web on how to make those old supplies into a sweet little coop! Online – If you aren’t into going through the added time and effort it takes to create a coop from scratch, we totally get it! We all have busy lives and it may be worth the investment of simply purchasing a new coop online. We review many available new coops, big and small, in this article and over here. We hope you’re brain is churning with ideas for building or buying your next chicken coop for two 😊. As you can see, there are a myriad of options to choose from and we have really only scratched the surface here. If you have other ideas for a small chicken coop, leave a comment below – we’d love to hear about them! Thanks for stopping by. Next Article Chicken Coop Flooring Materials – Wood Is Great, But There Are More!